Promo codes are a great way to encourage customers to secure a purchase when they receive the Kit Karts recovery email. Here's how to implement the code within your recovery email template. 1. 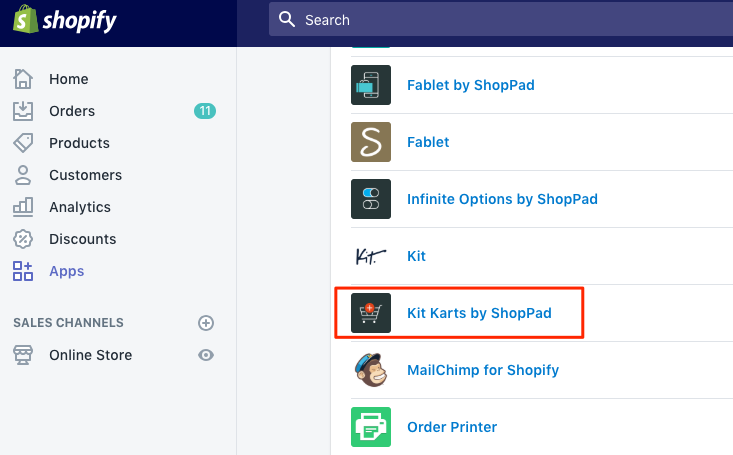 Navigate to the Kit Karts dashboard from the Shopify Apps page. 2. Scroll to the very bottom of the page until you reach the Recovery Email template section. 3. Copy the following code. 4. Click on the Edit HTML button below the email template. 5. Within the code, look for a line of code that states <p>Thanks for shopping!</p>, which should be listed somewhere around line 45. 6. Once you locate that line, place your cursor at the beginning of the code on that line and press the ENTER key on your keyboard. You can adjust the text in between the <strong> code based on what your actual promo code is. 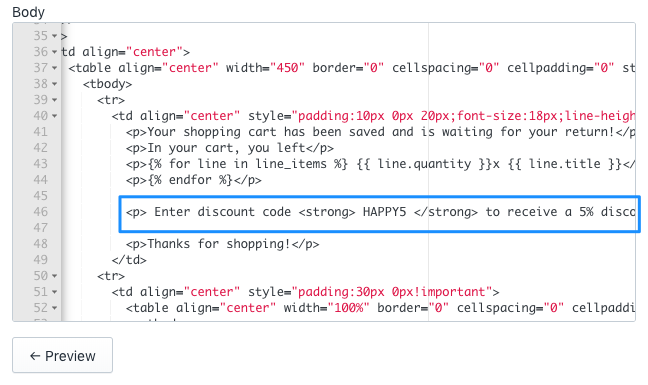 All of the text in between the <p> tags can also be adjusted based on what message you'd like to provide your customers. 8. Click on the <-- Preview button below the template to revert back to the normal email view to see how it looks. 9. Click on the Save Changes button at the top-right corner of the page.